Uruguay’s certainly a hot spot, but its capital city, the historic port of Montevideo, doesn’t often get the attention it deserves. Most travelers blow right through it on their way to Punta del Este and the stylish beach getaways down the coast. 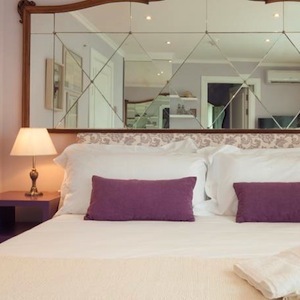 Alma Histórica Boutique Hotel, in the heart of Montevideo’s Ciudad Vieja, is enough to make you want to stay in town for a night or three. Apart from being an elegant place to sleep, this fifteen-room boutique provides something of an introduction to Uruguay’s history and culture. Alma Histórica is located inside a restored colonial building, just blocks from the port. Each of the fifteen rooms is individually decorated, inspired by the story of a famous Uruguayan, from musicians, poets, and painters to theatre actresses and athletes. The look is old-world with a modern twist: floor-to-ceiling French doors, romantic wrought-iron railings, opulent bed frames, whimsical black and white wallpaper. All rooms feature Egyptian cotton linens, a pillow menu, Smart TVs and eco-friendly bath products. Some in the Superior category have balconies or views over Zabala square. 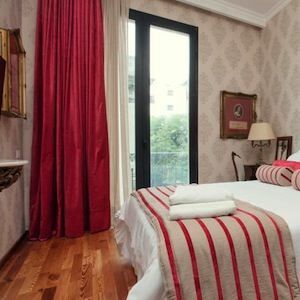 And at the top of the line is a suite, fittingly named after tango legend Carlos Gardel, with a large private terrace. For everyone else, there’s Alma Histórica’s public terrace, high up above the treetops and appealingly furnished with chaise lounges and a wood-paneled Jacuzzi. Breakfast is served downstairs in the Tea Room, and in the afternoon and evening, the Library, inspired by the look of Montevideo’s old mansions, is the perfect place to try Tannat, Uruguay’s fine but little-known red wine. The hotel is indeed the kind of place that makes you want to stay longer — perfect, as this is Uruguay, famous for its laid-back charm, a place where no one is in a rush.